Carly Fiorina is a businesswoman and non-profit leader who knows that human potential is the one limitless resource we have. That’s why she is committed to helping organizations deliver, adapt, and reinvent through transformational leadership. After getting degrees in Philosophy and Medieval Studies from Stanford University – and taking one semester at UCLA to figure out law school wasn’t for her – she began her career as a secretary at a small real estate firm. She eventually found her way to AT&T where she led the spin-out of Lucent Technologies. In 1999, she was recruited to become the CEO of Hewlett-Packard, becoming the first woman to lead a Fortune 50 company and grew HP to the 11th most profitable company in the US. During her six years at HP, they doubled revenue to $90 billion, quadrupled growth to 9 percent, and tripled the rate of innovation to 11 patents a day. She is now proud to chair Good360, a non-profit leader that has distributed over $7 billion in product donations to over 30,000 community charities across the US and the world; Opportunity International, the largest non-profit micro-finance lender in the world, giving out $6 billion at an average of $150 per loan and lifting millions out of poverty. 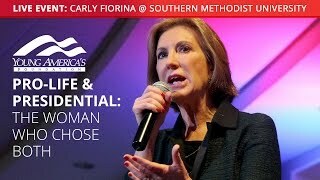 As chairwoman of the American Conservative Union Foundation and the Unlocking Potential Project, Carly has traveled the country advocating for positive conservative policies to grow the economy and create opportunity.